I am an analytical person. I’m also a writer, so I get to put all this analytical nebula into some form of order, which is a relief for my brain. We also both donated blood at some blood drive in our Senior year and found out we are both O-. We are also both Scorpios. We’re both Christian, we are both conservative, we are both madly in love with each other (he’s super hot). We really had no other choice than to get married to each other…the stars, our brains and our blood said we belonged together. Anyway, the test wasn’t a big deal back then, since it didn’t mean much to me at 17. I was still figuring out who I was, what I wanted to study in college, how to find housing/food. It was an interesting test back then, but nothing terribly life changing. Fast forward 20 years, and I am a housewife with a college degree, a little urban homestead, married to the most hunky husband on earth and 5 homeschooled kids under our belts. Let me just say that being an INTJ woman is an interesting ride. Mostly because, as an INTJ, I am analyzing everything…and everything about what it means to be an INTJ woman. Although it is fun for me, since I already analyze everything else in life, I can imagine it is exhausting (and maybe irritating) for people around me. Which is why it is totally great that my husband is INTJ as well, and we can just bury our brains in analyzing the details of life, and then re-analyzing the results, for hours (days). I love him: he gets me. The problem really happens when I am around people. 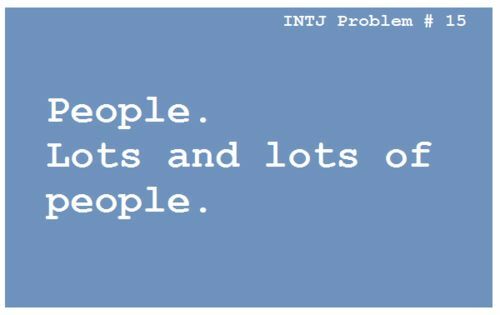 INTJ’s aren’t people-people. They are person-people. I can have amazing conversations with either a person, or to an audience. That’s about it. so I just take notes. Because that’s what I do. My purpose is to listen, observe, learn for later reflections, figure out what the general flow of the group is, participate in conversations politely, and under no circumstances go into half hour long diatribes about my own personal opinions about the nature of the universe. At least, that’s my goal. Women are particularly difficult for the INTJ to be around because they/we are so…dynamic, I think. We change emotions between blinks, we worry about silly things, like the color of our nails (yes, I know it is important). There are hours and hours, bleeding into days and days of conversations that can morph from healthcare to home decorating to parenting styles to diet choices; and usually the changes happen within a few minutes. But the INTJ woman is listening from behind the crowd. She is hovering around the nebula of the group and interjecting, not contributing, to the conversation. She is forming conclusions on her own and taking notes for later use. The event of socialization is a pragmatic function with a goal: to learn more about her peers, and to exercise growth within herself. This sounds incredibly academic, and to us it is. But the INTJ woman in a group tends to be the delicate balance of blending in without sheeping-out: we wouldn’t want to stand out too much, or we’d just be ENTJ (belch). However, we must be true to ourselves, so we make a point to wear clothes we feel comfortable in…which might be boots and a sundress, it could be tats and a tank top. I guarantee you, though, the words the INTJ woman has to say will be laced with confidence and security. We might not know how to do our make up, but we sure as hell know what we are saying. The point is, going to a conference as an INTJ woman isn’t daunting. I have already planned in my head how to mentally deal with accepting SWAG, business cards, handshakes…followed by mandarin orange scented hand sanitizer…how to smile politely without looking harried, desperate or overly friendly, and where the local speakeasy is so I can take a break and recollect myself at the end of the day (or the middle of the day, we’ll see. Ask me for details, I have this all planned out). 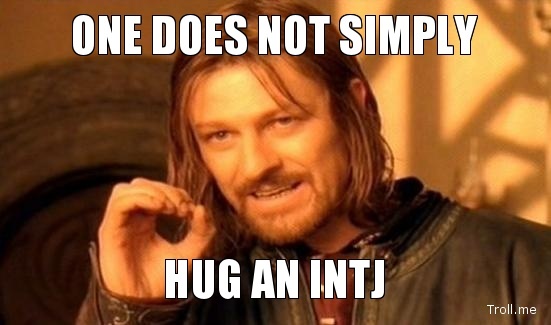 The INTJ woman will be the most interesting person you will meet at the conference, and she will have a million questions for you. But please don’t hug us. We will misconstrue the physical affection for intimacy, and you will have a woman on your hands verbally putting the pieces together for half an hour in order to conclude that some people like to hug because it is an act of friendly affection, and they are not, in fact, hitting on us. Oops – just saw the reference link at the bottom of the post! I loved reading your post. I have recently taken the MBTI and have found that I am a INTJ. I love talking with other INTJs. Life just makes sense 🙂 Although I tend to attract ESFPs in life, which is so much fun as well. So many emotions. Although this is older post now, I have to tell you that I really enjoyed it. 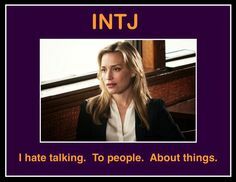 It captured both the positive and completely terrifying aspects of being an intj female..like, “THE HUG”…lol.😉 I cracked up at the sanitizer comment as well. Aside from that, or rather, in addition to those things, everything else was spot on as well. Enjoyed! It is nice to see another INTJ female in the wild!